Super Duty F-Series of pickup trucks in Ford are bringing a lot of profit. The light-duty half-tone F-150 might be the best-selling vehicle in the US, but heavy-duty trucks are better working machines. 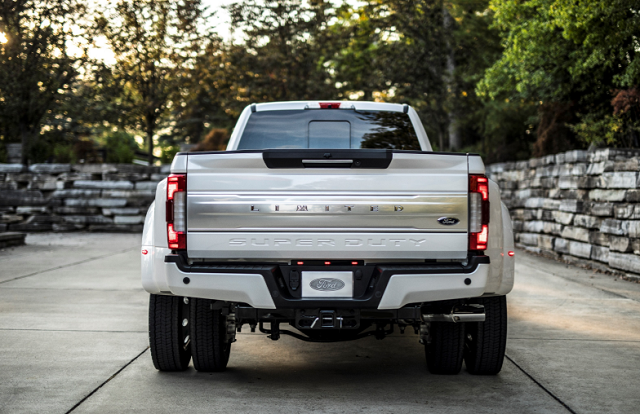 If you need to pull a lot of cargo, then Super Duty is the right choice. There, buyers will pick either F-250, F-350, or F-450 model. 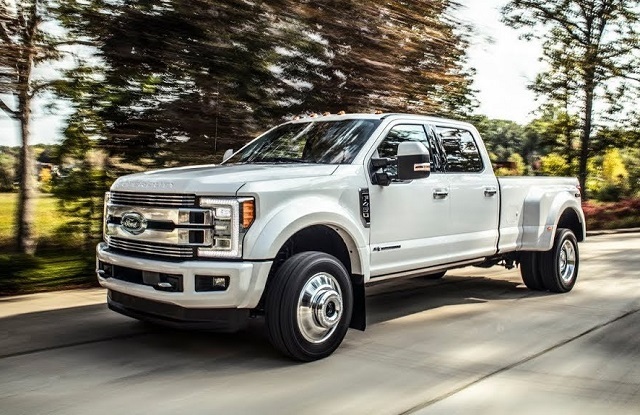 The 2019 Ford F-450 is the most capable truck in the family. With dual rear wheels, it can tow over 30,000 pounds. Compared to its sibling, the largest model comes only with diesel engine. The 2019 Ford F-450 could change things up and add a petrol unit as well. Smaller F-250 and F-350 are already using a 6.2 V-8 powertrain. On the visual end, the F-450 pickup will come with only minor cosmetic changes. However, cockpit of this truck is like a home. And the luxurious one! 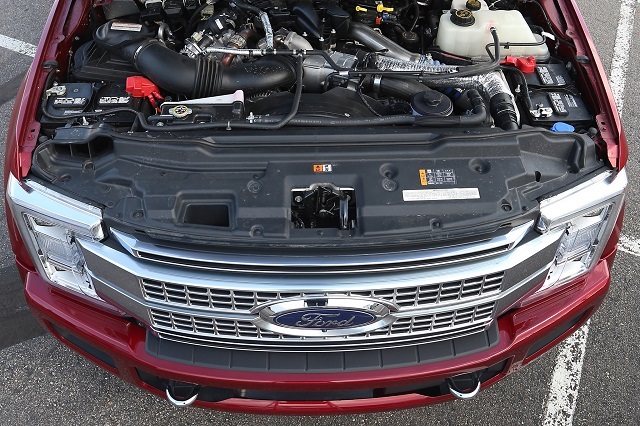 Under the hood of the 2019 Ford F-450 we will definitely find a diesel engine. It is a 6.7-liter V-8 Powerstroke mill. With torque at 925 lb-ft, the F-450 is a class leader. For the next season upgrades are possible to prevent Ram to overthrow this record. The new Ram HD could deliver 930 pound-feet from its Cummins unit. The Ford F-450 is able to tow 32,500 pounds. This is another class-leading number. But, it is not all about the diesel engine. Supreme system offers extra stability and traction thanks to the dual wheel setup. With 2019 Ford F-450 dually, the truck will move safer and better in different situations and road conditions. For the next 2019 Ford F-450 engineers could tune a 6.2-liter V-8 engine. Other trucks in the lineup are using this powertrain, which can’t offer so good towing records. However, it can pull up to 16,000 lbs in some configurations. Also, dual rear wheels are not available for models with gasoline engine. The news is a 10-speed transmission. It replaces the old six-speed gearbox. This truck continues to use rear-wheel drive by default. All-wheel drive remains optional. The output of a V-8 petrol unit is 400 hp and 410 lb-ft of torque. 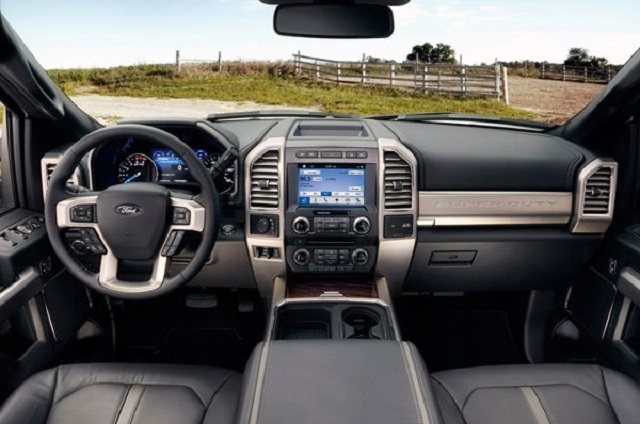 Without some big changes on the exterior, Ford will update the cabin of its Super Duty truck. It is already packed with a lot of interesting features. However, the most notable equipment is for safety. Assist accessories will help a driver while towing, parking, and driving. For example, the F-450 comes with adaptive steering, which boosts maneuvering. This is quite helpful feature, especially for parking and towing. With cameras all around the truck, even the less experienced drivers will manage to park such big vehicle. Of course, blind spots are covered as well. The highlight of all features is AdvanceTrac System. Stability gets an improvement. It comes with a Roll stability control. Drivers will find these two useful during cold weather and icy road conditions. All features are spread across six trim levels. The entry-level 2019 Ford F-450 XL is going to offer base equipment. More features buyers will get from XLT. The real deal starts with Lariat model. King Ranch truck needs serious investment. Platinum and Limited trim levels are on the high end. Of course, most equipment and the highest prices are coming in the same package. The base XL truck will cost over $50,000. Well, some could think this is pretty high start, but the end is at luxurious segment. Limited truck is going to cost $90,000. Platinum trim for 2019 Ford F-450 will reach $80k. Petrol models will cost nearly $10,000 less for all trim levels. Also, the price will depend on bed and cab configurations.